I know it's supposed to be autumn now, but we still have some pretty good weather at the moment. Therefore, before it rains again, I'll still be able to write about the odd summer ale I have in the fridge. 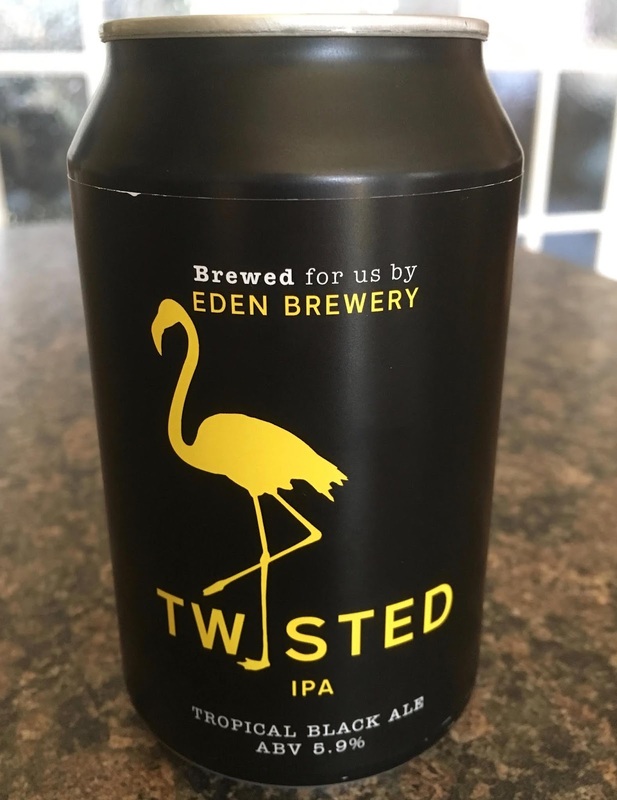 Not much could be odder than this Twisted IPA from the Eden Brewery, in Cumbria. First of all it's a black IPA, which isn't all that common. American Citra hops and Azacca hops were added late in the boil for a burst of citrus and tropical flavours, as well as Mango and Guava were added with a final heap of Citra. I'm not all that keen on Mango as a flavouring, so I'm hoping it doesn't overpower the rest of the flavours of malts and hops. At a hefty 5.9% volume, Twisted had a very tropical fruity smell on opening the can. There was Mango, but there was also Guava in the smell, followed by citrus and further fruitiness from the hops. Lightly carbonated this deep brown almost black in colour Indian Pale Ale poured with a frothy creamy head. On taste it was pretty sour. Certainly not for the faint hearted. There was a blast of tropical fruits to start with that keeps strong and true all the way through each mouthful. Guava actually was the initial predominant flavour, which is a flavour I rather like. Guava mixed well with the sweetness from the Pale Malt, just as other bitter hoppy citrus and hoppy fruitiness joined the fore. Here the Mango also resided, mixing with the full-bodied citrus and fruity hops for an additional and not unwelcome bitterness. Twisted is a complex craft IPA, perfect to be enjoyed on it's own or with a spicy or fishy meal, or indeed a spicy fishy meal!